Chun still got those big man-hands of hers. Last edited by xfaderx; 12-06-2014 at 07:50 PM. Sf4 with better graphics. To be honest thats capcom after ail. the one thing im glad they finally did, is the stage destruction. Guile's search finally ends ! or will it ? My friend brought up an interesting point about how SFV is literally a waste of everyone's money and support in light of the release of Ultra and the downloadable Omega Mode. I personally agree. They started production on this crap way too soon, and they're releasing a game that will likely be replaced by a super version within six months or less. 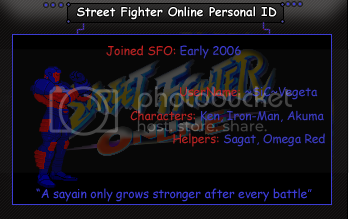 seriously, look at all version of street fighter through history... you'll see this has never stopped since the beginning. your friend just barely seen this ? tell him this... there is like 10 version of the game street fighter II, there is 3 version of Alpha, there is 3 version of SFIII there is 3 Version of SFEX, there is what 4 version of SFIV. if that alone didn't proove him that it is how capcom does thing, then i wonder what will. seriously, this shouldn't even be a surprise. Theres a whole new ex system for 1 with is a major tweak. Im sure there are dozens of minor tweaks to the game as well. And usually sequels to any game look like the previous with enhanced graphics so i missed your point. You want them to redesign every char in every sequel of the game they come out with. They had that back in sf2... and the background does get destroyed in sf4 on certain stages. Its not as obvious as in this one tho. a game a year... we all know what it does, we've seen it with capcom ever since SFII. we've seen it with call of duty and we've seen it with other companies as well. from the videos, SFIV with better graphics. 1 new mode of play doesn't make a game. look at the differences between Tekken 2 and Tekken 3 and you'll understand what makes a game sequel. look at SF3 and SFIV, thats a game sequel. anything else, the same engine adding only a few moves here and there, and adding a new mode.... thats not a game sequel, its called an update on the current game. not saying updates aren't cool, they totally are, they push the game further and thats good. but up to this point, calling it a sequel is a bit too much. but thats capcom... they called every SFII games a new game while it was just minor tweaks. all this to say, i am not impressed like i was in SFIV when it came out. as for destruction... i mean real destruction, not just a barrel or two that explodes... i mean like you get hit thru a wall and actually change stage , basically stages that aren't just 2D stages, they actually are places. Also I would get the game, but I'm pretty sure down the line they will release another COMPLETE version because you know capcom gone capcom. Looks awesome though man and if I do get it, I'll probably get a fight stick. how can i be hating on a game franchise i have been playing for 20 years ? seriously, you guys have to stop pretending that the game is better and better all the time. its not because its a new installment that it is better. also, am i the only one noticing how they have released a new version of SFIV not even a year ago ? and now they are throwing this one up ? either this is gonna take another 2 years to come out... either they simply wanted your money and now wants even more... thats capcom we're speaking, great games, great company... great profit out of poor members base is also part of their stuff. yes graphically speaking, its awesomely done, but what else does this have ? cause for me, im not a fan of updated graphics = better gaming. graphics are far from making the games. i still see 2D games still thousand times better then 3D ones. give me a list of stuff there is in there and i'll see if i'll like it. but there is one thing i know for sure... i'm not gonna throw out 70$ for this game. Well I can't give you a list of anything since the trailer was a small sample size but it did look good yet you still hate. I'm pretty sure the game will have new features and not just improved graphics. You're already hating to me it seems like and the game was just recently announced and this is coming from a guy who probably won't buy it day one because I'm not a big fan of SF on the consoles and I buy a ton of games.